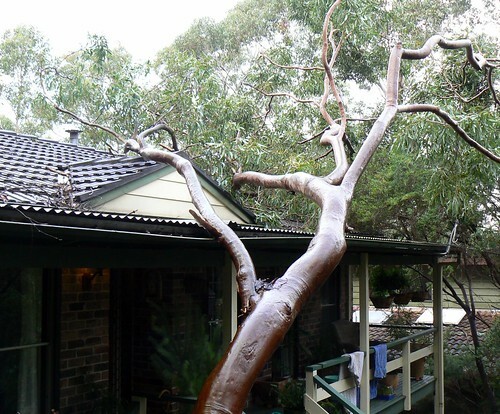 What do you do when when a huge Angophora costata has landed on your house, you're waiting for the State Emergency Service to arrive, and you're sitting on hold waiting to talk with the insurance company? The south-east coast of Australia is having seriously wild weather, massive winds, and we've had over 100 mm of rain in the last 24 hours. All too much for this tree, unfortunately. But no one's hurt, we've still got power (for now, anyway) and so far, it doesn't look like the damage to the roof is going to be too bad. And to think I was hoping to do the pond this weekend. As things go, it looks like my new garden beds will be destroyed by the tree removal operation. And that's bloody annoying. Think happy thoughts for us! UPDATE: The nasty weather didn't eventuate this afternoon, and the forecast looks okay overnight. So I think we won't be invaded by ents in the near future! Thanks for the concerned emails. They're very much appreciated. I hope that things sort themselves out for you without too much further bother. I wish you could redirect some of your rain down here, we have had none and desperately need some. Thanks, Michael. Isn't it awful that some places sometimes get too much, while others are left parching? The thing that drives me craziest about all this is that if Sydney had masses of domestic rainwater tanks (we're finally about to be able to afford to install one, along with the plumbing to use it for the loo), plus decent storm water harvesting, we would have water to spare in this city. I really hope it rains on your patch soon.